Rajasthan is the largest state in India and as its literal translation “Land of the Kings“ suggest, it has the capacity to astound and impress. 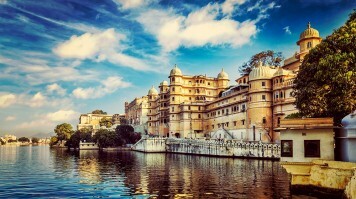 Its war-ridden past, and the splendour and opulence of the maharajas can be seen until today. Impenetrable forts and decorated palaces with magnificently extravagant interiors may have been converted into hotels and museums, but they are no less impressive. Aside from architectural wonders, Rajasthan offers festivals, bazars, wildlife sanctuaries and the picture-perfect Thar desert attracting increasingly more visitors. Welcome to your Rajasthan tour. December to February is generally the best time to visit and also the busiest time in Rajasthan. The days are sunny, humidity is low, and nights are cool, although temperatures can drop down to 0° C.
October, November and March can be considered shoulder season with mild temperatures and lower prices. April to June is scorching hot summer and July till September is monsoon, both least busy times in Rajasthan. Rajasthan is known for its abundance of magnificent architectural treasures with Jaipur and Udaipur leading the way, and lesser known sites like the Mehrangarh Fort following suit. Jaipur offers landmark attractions like the 16th century Amber Fort, the intriguing Hawa Mahal and the City Palace still occupied by the royal family today. Udaipur, considered India’s most romantic city, captivates by the harmony of palaces and historical structures dotted amidst lakes like the City Palace, or the Taj Lake Palace set on Lake Pichola. Beyond architecture, visiting a local fair and exploring Rajasthan’s natural beauty will provide truly unforgettable and more all-rounded experience. The Pushkar Camel Fair in November, Desert Festival in January and Brij Holi in February are some festival possibilities. For natural beauty, the undulating sand dunes of Thar Desert and the ample wildlife sanctuaries like the Ranthambore National Park or the Sariska Tiger Reserve are a must visit. 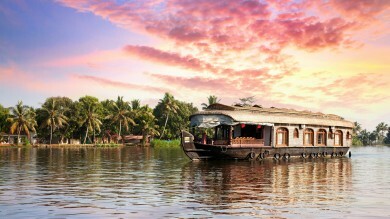 This 15-days tour encompasses architectural treasures, rural traditions, natural beauty and dose of wildlife. Starting in Delhi, after marvelling at the iconic Taj Mahal and admiring the imposing Red Fort in Agra, you will be whisked away to explore Rajasthan’s treasures. The opulent landmarks of Jaipur will give way to the holy city of Pushkar, before sampling rural life in the picture-perfect Thar Desert and then visiting the impressive Mehrangarh Fort and bustling city of Jodhpur. In Deogarh, a unique opportunity to visit a local primary school is followed by an afternoon of birdwatching, before finishing in Udaipur. Celebrating Rajasthan’s royal past when rulers ostentatiously displayed their mind-blowing wealth creating splendid architectural structures that defy the test of time, this 14 days private Rajasthan tour shows India at its best. Starting with the Golden Triangle (Delhi, Agra and Jaipur) it continues towards the princely state of Bikaner. 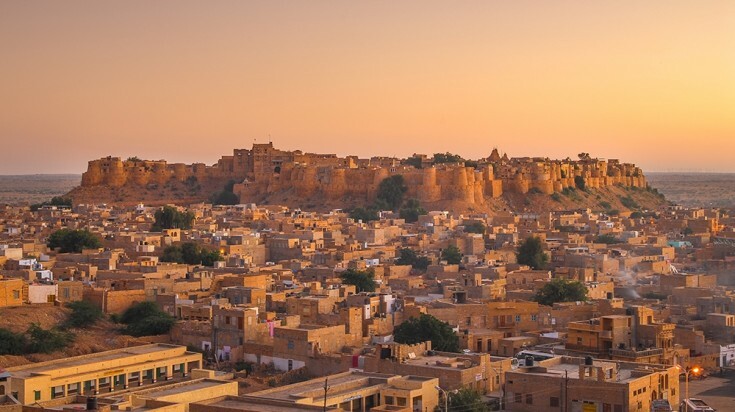 Next is the Golden City of Jaisalmer in the Thar Desert and other must-see strongholds, seeking to showcase noteworthy palatial and religious structures imposingly built within the raw natural beauty of India’s largest state. In 14 days, explore the Old and New Delhi before travelling to capture the splendid sunrise over Taj Mahal, continuing to the abandoned imperial city of Fatehphur Sikri and finally reaching the Pink City — Jaipur. Following the old camel caravan routes of Rajasthan, the guide will then steer the group towards the desert cities of Bikaner and Jaisalmer, leaving enough time to admire local bazars and handicraft stores. 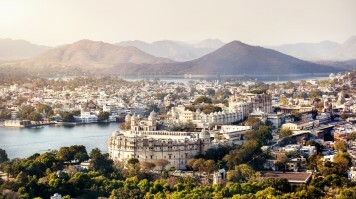 After exploring the Blue City — Jodhpur, the dramatic Merangarh Fort, temple town of Ranakpur and the 15th century Kumbhalgarh Fort, you will reach the lake stronghold of Udaipur. Pick-up from Jaipur Railway Station / airport and transfer to a heritage hotel to check-in. Afternoon tour of the Pink City, visiting the Birla Mandir and Sisodiya Rani Temples and finishing at the Nahargarh Fort to watch a magnificent sunset engulf the city. Start the day by riding an elephant to the main entrance of the Amer Fort. After exploring the fort and the nearby stepwell Panna Meena Ka Kund, we stop to admire the lake palace Jal Mahal, and continue to the magnificent City Palace. Afternoon is spent at the mesmerising Sheesh Mahal, followed by a visit to the astronomical treasure Jantar Mantar, before free time in the old city’s streets and bazars. After check-out, we see the intriguing Jawa Mahal with its 953 windows, used by palace women to observe the happenings in the street below, undetected. We then drive to the Ranthambore National Park (4 hours) for an afternoon jeep safari. It is the best place in India to see the Bengal tigers in their natural habitat, amongst multitude of other species of animals and birds. The night is spent in a nearby luxury tented camp. The day starts early by a jeep safari, with more opportunities to observe the Bengal tiger and other game and birds in different parts of the Ranthambore National Park. After the safari we return to the camp for breakfast, before a drive (6 hours) to reach the Chittorgarh Fort in time for sunset. The night will be spent here in a heritage hotel. After breakfast, we will visit the UNESCO heritage Chittorgarh Fort, one of the largest forts in India, before continuing to the city of lakes (2.5 hours), also called the white city, Udaipur. We have lunch in one of Udaipur’s excellent restaurants before an afternoon tour of what’s considered one of the most romantic cities in India. 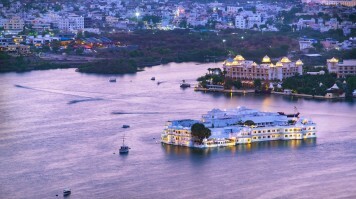 The evening will be completed by a boat ride on the iconic Lake Pichola. The day will be spent exploring Udaipur, with free time in the afternoon to do shopping and explore the city independently. The elaborately decorated City Palace complex with its integral Zenana Mahal, Fateh Prakash, Shambhu Niwas and Durbar Hall will be our first stop. We will then make our way around other key attractions including the Sahelion-ki Bari and Jagdish temple, before parting for the rest of the day. Starting early, we drive to the wild landscape of Mount Abu (3 hours) for an overnight trekking and camping experience. After arrival we start trekking towards the camp, stopping for authentic lunch in the fields, enjoying the magnetic scenery of this ancient mountain range. Upon reaching the camp, we have a break before the evening trek to watch the hypnotic sunset over the hills. This will be followed by a bonfire and delicious dinner. The day will begin with a trek to watch the glistening sunrise, before returning to the camp for breakfast. After breakfast we set on a trail through this beautiful terrain, stopping for plentiful photo opportunities, until we reach the town before lunch. After early lunch, we start the long drive towards Khuri Village in the Thar Desert (8 hours). Here we stay overnight in the traditional round mud houses, arriving to bonfires and folk music. The morning starts by a village walk, admiring the traditional way of life in the Thar Desert. After breakfast of authentic Rajasthani food we set off on a camel safari on the Khuri Sand Dunes, riding elaborately decorated camels, hoping to spot local fauna with plethora of migratory birds. The night will be spent on the Khuri Sand Dunes, marvelling at the star-studded night sky and watching the Kalbeliya dances. 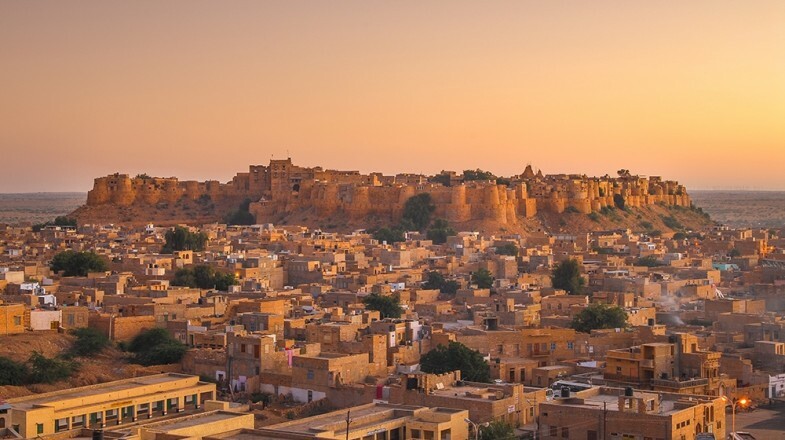 After a delicious Rajasthani breakfast, we proceed the short distance to the Golden City of Jaisalmer. Here we get to admire the magnificent Jaisalmer Fort and Jain Temple inside the Sonar Quila, visit the elaborately carved Havelis of Salim Singh and Patwon, the Gandhisagar Tank and other attractions. Rest of the afternoon and evening is spent at your leisure, when you can admire the city basking in light after dark. After breakfast we check-out and drive to Bikaner (5 hours), stopping for lunch on the way. 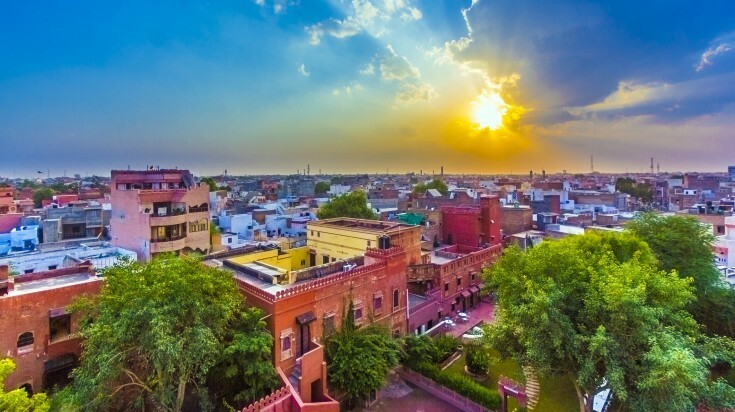 The afternoon is spent in Bikaner sightseeing the Rao Bikaji, the Karni Mata Temple and visiting the 16th century Junagarh Fort constructed by Raja Jai Singh, Mughal Emperor’s army general. The rest of the day is free to relax and enjoy the surroundings. The morning highlight is visiting the only camel breeding farm in Asia, which gives Bikaner its nickname ‘the Camel Country’. This is a truly unique experience. 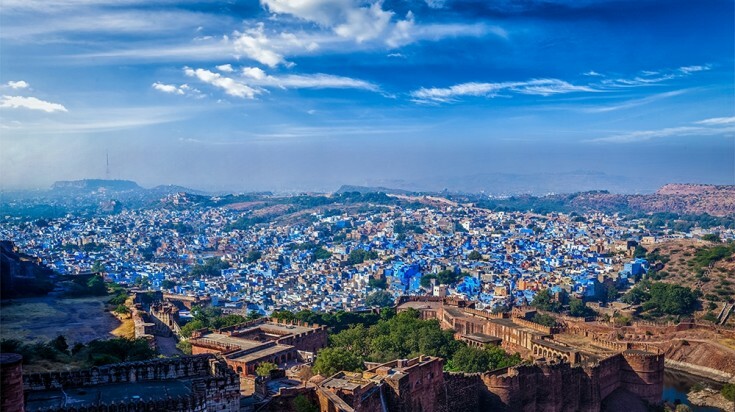 We then set-off towards the Blue City — Jodhpur (5 hours), stopping for lunch on the way. After arriving and checking in Jodhpur, we visit the Mehrangarh Fort set on a nearby sandstone hill. In the fort are also the impressive Moti Mahal and Phool Mahal. After breakfast we visit the white marble cenotaph of Jaswant Thada, built by Maharaja Sardar Singh of Jodhpur in memory of his father Maharaja Jaswant Singh II in the 19th century and the beautifully set Umaid Public gardens. 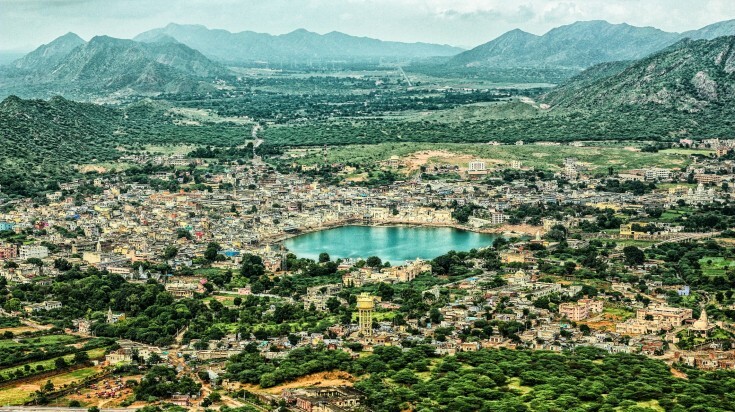 We then continue to the holy city of Pushkar (4 hours), in time to check-in and attend the unmissable evening Aarti at the Varah Ghat filled with chanting, bell ringing and thousands of floating diyas. We start the day early with a hot air balloon ride, as the sun rises with its soft rays slowly lighting up the numerous temples, ghats and lowrise buildings surrounding the lake. After this magnificent experience, we continue for a tour of the city, visiting local bazars, sampling delicious specialties and enjoying the many attractions along the way. If we travel in November, we also visit the annual camel fair. After a fulfilling authentic breakfast, we bid farewell to Pushkar glowing in the morning light and set off to our starting and final point, Jaipur. Here we part our ways full of unforgettable memories that will last a lifetime. 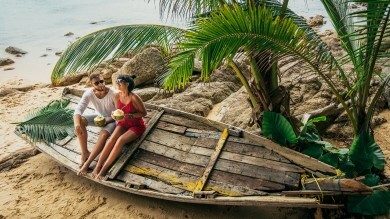 Connect with one of our local Travel Experts in India, to plan a customized trip in Rajasthan. 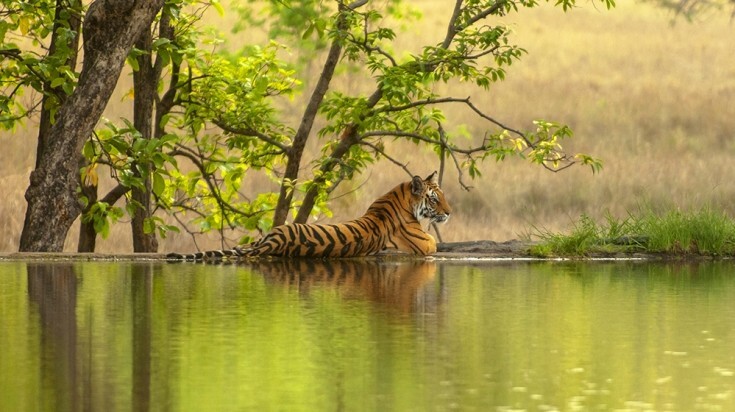 Although Rajasthan looks magnificently lush during monsoon, many wildlife sanctuaries are closed during this time, subject to June decisions by the forest department each year. Vegetarian restaurants are some of the best in the country thanks to three quarters of locals being vegetarian. Festivals and fairs are plentiful and major part of Rajasthan culture, so make sure to time your visit to hit the favourites. Mono colour cities like Jaipur ‘The Pink City’, Udaipur ‘The White City’, Jodhpur ‘The Blue City’ and Jhalawar ‘The Purple City’ create excellent photo opportunities. Trucks sport colourful art with saucy Bollywood actress depictions and funny slogans and are worth watching out for. It is no accident that this geographically diverse state in north-western India attracts significant portion of India’s tourism each year. Proudly riding on the opulent wave of its battle-ridden yet spectacularly wealthy past, Rajasthan’s architectural and historical heritage aims to impress. Combine that with the abundant wildlife, colourfully festive traditions, charming rural life and spellbinding nature dominated by the undulating sand dunes of Thar Desert and you have the perfect Rajasthan tour package promising to delight even the most demanding of visitors.